Walk in & Wet Room. Luxury Frameless Offset Quadrant Shower Enclosures Designer 8mm Easy Clean Glass. Basin & Bath Tap Sets. Modern Chrome Freestanding Bath Handheld Shower Mixer Bathroom Filler Tap TB148. Did you know we use only the highest quality raw materials? We only use a minimum of 59% to ensure the longevity of your tap, the higher the copper content the better rust resistance, meaning your tap wont rust after 6 months. Similar taps on the market only feature 55 - 58% copper, and simply wont last. Did you know we use the latest technology in the manufacturing process? Our freestanding taps are the perfect complement to any modern bathroom with its curved design and hand held shower head. The taps are made from solid brass, and fitted with the latest ceramic disc technology they are finished in chrome to ensure a highly reflective mirror finish. We offer a 10 year guarantee, so you can be confident that our products will last. Freestanding Bath Filler Tap - with hand held shower head. Chrome plated solid brass construction. Minimum 1.0 bar water pressure. 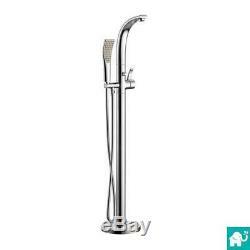 Modern design Freestanding Bath Filler Tap - with hand held shower head Solid brass body Chrome finish Easy to operate levers Quarter turn ceramic discs 1.5 metre - rust resistant stainless steel - shower hose Minimum 1.0 bar water pressure 10 Year Guarantee. We mould our taps by Gravity Die Casting to ensure a stronger more durable tap. We use CNC Machinery to cut all of the threads on our taps to ensure 100% accuracy, creating a tighter fit which eliminates leaks. Other manufacturers cut costs by engraving their taps by hand, these taps are more susceptible to leaks due to the inaccuracies of hand engraving. Did you know we use Sedal ceramic discs? Our taps feature the latest ceramic disc technology that with a quarter turn forms an impenetrable water tight seal. Other taps feature rubber washers that after time start to perish which leads to dripping. We use the very best Sedal discs, that are tested up to 60,000 times, the equivalent of turn your tap on and off 16 times a day, over 10 years. Did you know our taps are hand polished? Before we chrome our taps the brass is hand polished to create a great smooth surface that makes it easier for the chrome to bond. Did you know we finish our taps in Chrome? Our taps have a highly reflective mirror finish that stays looking new for longer. You can test the quality of chrome by simply placing your finger on the chrome, on poor chrome your finger will leave a mark on good chrome your finger print will disappear. Did you know our taps are double tested? Our taps are tested twice during the manufacturing process. Our taps are air pressure tested before they are chrome plated, and water pressure tested before they are packaged, as a result of this there many be some water still inside your tap when you receive it. Did you know we offer a 10 Year Guarantee? Because we go the extra mile and dont take short cuts in the manufacturing process we are happy to offer a 10 year functionality guarantee. Our taps work on water systems that produce a minimum of 1.0 bar pressure. This can be achieved by using one of the following systems: - Combination boiler systems - Gravity fed systems (only with a pump) - Megaflow system - Pumped hot water systems - Un-vented hot water systems - Standard pressurized hot water cylinder type systems. Free Standing Bath Filler Tap Chrome Mixer Faucet Hand Held Shower Head TB3086. Modern Chrome Bathroom Curved Basin Sink & Bath Filler Handheld Shower Taps. 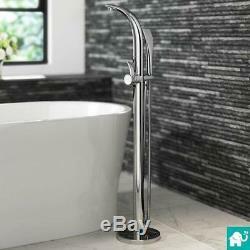 Modern Chrome Freestanding Thermostatic Bath Mixer Shower Head Bathroom Tap TB19. Giving you diverse bathroom ranges for less We strive for excellence in all areas of our products as well as taking pride in integrating stylish yet durable bathroom fittings into each range. From sourcing and designing new items, to ensuring all our customers receive excellent advise throughout their journey with us, as well as an industry leading aftercare service or 200,000 sq. We started trading in 2006 and have seen a great increase in sales and feedback from that point to now and will be trading for many years to come. With over 300,000 feedback you can rest assured you will be receiving the service and products you deserve from a leading bathroom company. Where on my property will you deliver to? Will I have to be home all day? Items must be signed for. This means someone must be available between the hours of 8am and 9pm. A card will be left with instructions on how to retrieve your order. How do I pay by Cheque or Postal Order? How do I pay via Credit/Debit Card? We can also accept all major Credit/Debit cards except American Express payments over the telephone by calling 02476 389051. Townsend Drive, Attleborough Fields Industrial Estate, Nuneaton, CV11 6RU. I dont want to keep my item but its not faulty help! This would also depend if we have stock in to send out to you. For guarantee reasons, we would need you to send photos of the faulty item with photos of the fault itself. Once this information has been received, we can assess the case and whether a part or replacement is needed. Counter Top Vanity Unit - WH. Floor Standing Vanity & Mirror. CC Toilet w/ Basin & Ped. CC Toilet w/ WH Basin. Company; 8013835, Registered VAT number; 163586191. 22-24 Boulevard Royal L-2449, Luxembourg. The item "Modern Chrome Freestanding Bath Handheld Shower Mixer Bathroom Filler Tap TB148" is in sale since Friday, July 4, 2014. 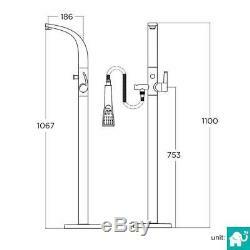 This item is in the category "Home, Furniture & DIY\Bath\Taps". The seller is "soakoutlet" and is located in GB. This item can be shipped to United Kingdom.